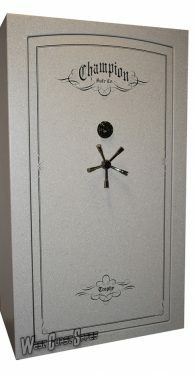 The Champion Trophy gun safe is built with the same exacting precision and superiority as Champion’s higher-end models. The Trophy Series, with the Steel Arch Doorway, offers rugged protection. Its 11-gauge body, reinforced with a Double-Steel Door Casement, provides a solid steel foundation. 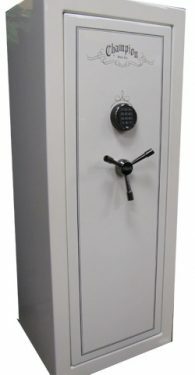 The thick Double Plate Steel Door with full inner door steel and numerous 1.25″ diameter four-way active door bolts provide excellent security. the Trophy’s door defense system includes Champion’s Auto-Relock system and Diamond-Embedded Armor Plate. To protect from the hottest fires, it boasts a 1500°F 75 minute fire rating. 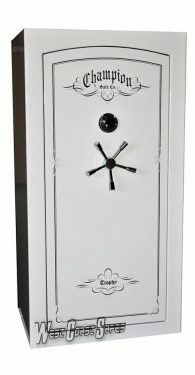 The Champion Trophy gun safe comes in beautiful high-gloss and textured finishes. LED Lighting illuminates its velour-covered interior and convenient door organizer. 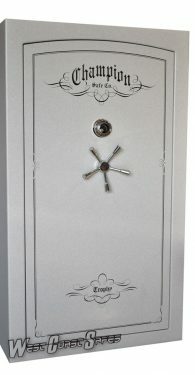 Other standard features include Internal Ball-Bearing Hinges, Five-Spoke handles, and Standard Sargent and Greenleaf Group II Dial Lock or Optional Electronic Lock. 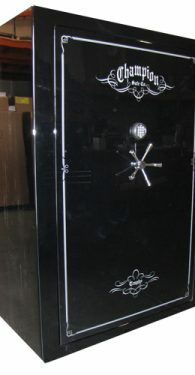 The Champion Trophy Gun Safe is considered to be one of the best and strongest gun safes in their class and provide great security at a very competitive price.